Quantity of needles: 798; Step: 3,5 mm (0.138 in); 6 plates length: 80 mm (3.15 in), width: 35 mm (1.378 in) and 2 regulable belts. If you are busy and have no time to use an applicator. 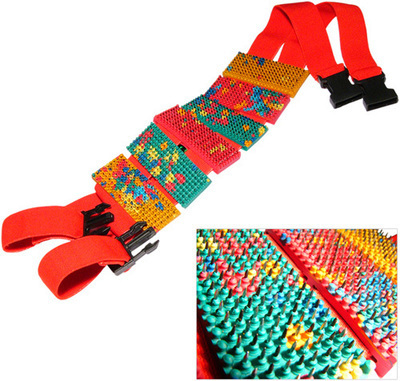 If you cannot tear yourself away from your favorite TV program or a computer, if you want to use the applicator, but you do not want to lie on it, the applicator belt will solve all the above mentioned problems. Nowadays the superficial needle therapy is easier to practice, more comfortable for patients and widely accessible. Owing to the reliable fasteners, the applicator belt can be fixed directly to the zone of pain, the zone of the reflected pain, the zone of pain irradiation or the zone of the diseased organ projection, the zone where there are biologically active points and meridians. Taking into account the abovementioned schemes, it is possible to affect the main, additional and subsidiary zones by turns, alternatively or selectively. The fasteners secure even pressing of the applicator to the body surface and enable a patient to move, to go on with his work and get treatment at the same time. You can easily, quickly and reliably fix the massage belt on any areas of the body, extremities or joints yourself, without any assistance, by means of regulating the length of the massage belt. • chronic pain relief – 30 minutes - 2 hours.